Here’s another clear map of the geographical situation during this time of Isaiah’s prophecies. The Assyrian Empire hovers there above Aram/Syria and Israel/Ephraim like a lion watching its prey. Judah sits below Israel, believing the pact they have made with Assyria will protect them. Our verse today, however, makes it clear that Assyria will sweep over Judah as well as Israel like a river overflowing its banks. The interesting little phrase, though that indicates the destruction will not be complete or forever is even to the neck. Just as God is going to protect Israel in today’s attempt to utterly destroy it, so God protected Israel in Isaiah’s time. Why? the last two words of the verse tell the reason: O Immanuel. The land belonged to Immanuel then, and it still does now. The UN and world leaders can make all the laws they want about Israel. The fact is, Israel is in for some terrible times–again! We are gradually seeing the fulfillment of the prophecy that all the world, including Obama’s America, will turn against Israel. But Obama can’t rule God, and his word will not be the final pronouncement over this land that he hates. Just as God preserved the land in Isaiah’s day, so will He preserve it again. Those who hate Israel today are going to be screaming in fury when God finally restores Israel to being the center of world government during the Millenial Kingdom. Obama has a few more days to do as much damage as he can. Don’t worry. He’s just a grain of sand in God’s sandal. Insignificant and easily brushed off. We’re seeing prophecy fulfilled. It’s exciting! Because the people of Judah and their king, the stubborn Ahaz, refused the peaceful, nourishing waters of Shiloah, there would be terrible consequences. They could have turned to God, but they chose instead to trust instead in kings in other lands to protect them. Ahaz foolishly made what he thought was a pact with Tiglath-Pileser of Assyria; God, however, likens Assyria to a raging, out-of-control river in full flood that would consume the land of Judah. The waters of Shiloah had been divinely provided at Zion and Moriah, and were symbolic of God’s promises concerning the throne and lineage of David. Those promises would be kept in spite of Judah’s rebellion, but there would be great suffering in the meantime. God always keeps His promises, in spite of our arrogant disobedience. However, we are not spared His displeasure when we choose against Him. We should pay attention. Isaiah 8: 2-4. :And I took unto me faithful witnesses to record, Uriah the priest, and Zechariah the son of Jeberechiah .And I went unto the prophetess: and she conceived and bare a son. Then said the Lord to me, Call his name Mah-her-shalal-hash-baz. For before the child shall have knowledge to cry, My father, and my mother, the riches of Damascus and the spoil of Samaria shall be taken away before the king of Assyria. I like to know where places are. Here you see the location of Samaria. 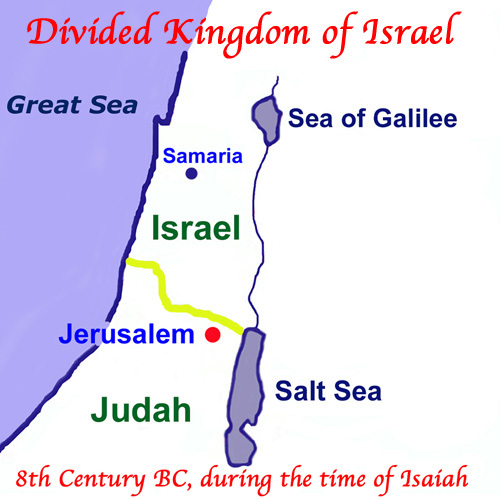 Syria (Aram) was to the north and west of Samaria, which was a geographical part of Israel (Ephraim.) Assyria was farther north yet, but extended its empire all the way through Israel, Judah, and farther south. In our passage today, we read first that Isaiah had a couple of reliable witnesses to what he had written on the tablet: The name Maher-Shalal-Hash-Baz, meaning plunder speeds, booty hastes. Booty is an old-fashioned word for the spoils of war; the conquering army took whatever grabbed their fancy, leaving those who still lived with very little by way of food, furniture, money, even clothing. These two witnesses (see II Kings 18:10 and II Chron. 29:1 and 13) would be able to attest to the people how Isaiah had long before foretold, by his inscription and by the name of his son, what had now come to pass. Then, we are told, Isaiah went in unto his wife, the prophetess. I’ve always loved it that Isaiah and his wife shared this calling. We don’t hear much about her, but she clearly had a part in Isaiah’s work. She conceived, and bore the son who would be named Maher-Shalal-Hash-Baz. So, from the time of conception to the birth of the child was nine months. He would not learn to speak the words Mother, Father, before the destruction of Damascus and Samaria came to pass. The King of Assyria, Tiglath-Pileser, would have swept through the area and left it in complete disarray. His sweep through Samaria and Damascus would be just the prelude to his attack on Judah, and King Ahaz should have been shaking in his sandals. Instead, he was deluded by his supposed alliance with Tiglath-Pileser, and would not, did not, choose to turn to God for help. Depression: Why Did This Happen? Will it Come Back? There are so many factors that can play into depression. Today I’m going to cover as much as I can in a reasonable amount of space. This could well end up being a multiple-part topic. Let’s look at genetics first. One of the questions I always ask a new client who presents with depression is, “Who else in your family, in your own generation or your parents’ or grandparents’ generations, has had a “nervous breakdown,” or been given some sort of medication for nerves, such as Valium?” Almost without fail, there is someone. Typically, there will be more than one in the family tree who has suffered from depression. What I do know is that some people are more resilient about how they handle stress than others are, and there is a personality type that can “run in the family” that does not handle stress well without some help. This is why I look for the genetic connection; it helps me understand if there is a generational tendency toward depression, and knowledge helps me know how best to help my client. At the same time, these folks are tremendously generous and others-oriented. Yet, they can be unbelievably critical, narrow, self-righteous, and unforgiving. Unforgiveness turns to self-pity turns to bitterness turn to depression. Tim LaHaye wrote a wonderful little book many years ago titled How to Win Over Depression. It’s an excellent resource. I also like his book on the temperaments. The latest rewrite that I know of is called Why You Act the Way You Do. I read his first temperament study years ago, and it’s been a most valuable resource ever since. It’s title is The Spirit-Controlled Temperament. All right. I suspect that’s about enough for this week. There is a great deal more to say on the how and why of depression, but I guess we have lots of time now that we don’t have to worry about the Mayan Calendar any more! Things were heating up. God used a very tangible way of warning King Ahaz and Judah that they were soon going to be in a very bad way. 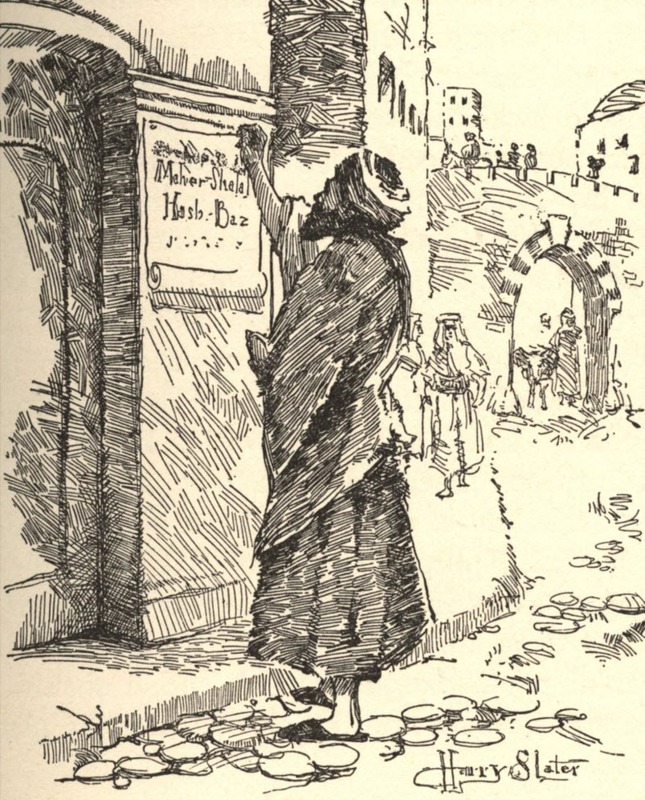 He told Isaiah to take a large tablet, not a parchment scroll but more likely a stone, and inscribe on it in common letters that most people could read. He was to write the words Maher-shalal-haz-baz. The meaning: The spoil speeds; the prey hastens. How about that for a name for you new little baby boy? There’s a lot more to this story, and it’s very interesting. We’ll take it apart tomorrow.